The Examination & Lifting Road Contactor Panel supplies the 630V DC Shore Supply to the examination road overhead conductor rails for the OST Overhead Switchable Trolleys. 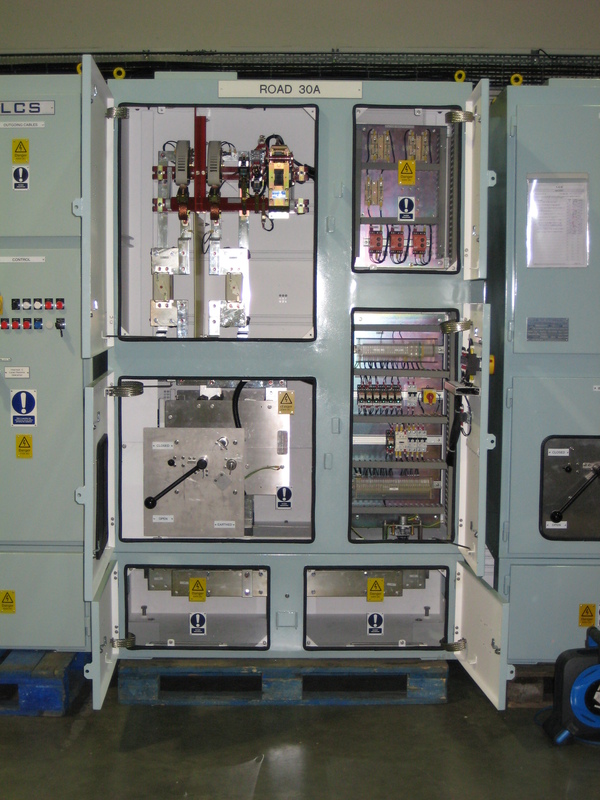 The Examination & Lifting Road Contactor Panel consists of a 2 pole 630A 1000V DC Contactor with associated control equipment, earth monitoring equipment, 2 x 400A traction grade fuses, and a 4 pole 1250A 1000V DC Disconnector for maintenance. Local controls are fitted on the front of the Panel. The Examination & Lifting Contactor Panel provides signals to the Overhead Status Indicators and to the Mimic Panel. The 630V DC is then fed directly from the Contactor to the Road Shore Supply for the Overhead Switchable Trolleys (8800290) OR to the Lifting Shed Power Pedestals (8800291). 4 pole Isolating & Bonding Disconnector, which has interlocks for Maintenance and Secure Isolations. These prevent contactor operation and the 630V DC supply when maintenance is being performed. The Contactor provides signals to the Overhead Status Indicators OSI and the Mimic Panel in the DDM Office. 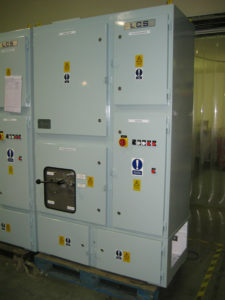 When the Disconnector is moved to the Earthed position the outgoing supplies to the Examination or Lifting Sheds are earthed and can be locked, making them safe for maintenance. The individual doors and barriers provide segregation between the sections and the 630V DC sections also have polycarbonate screens behind the doors.